- Special Easy Clean feature, quickly cleans jars for less delay between blending. - 450 watts of ice crushing power. - Our 450 Watt Moter lasts over 50% longer than leading competition. - Special ice Crushing function for smooth frozen crinks suchas fresh smoothies. 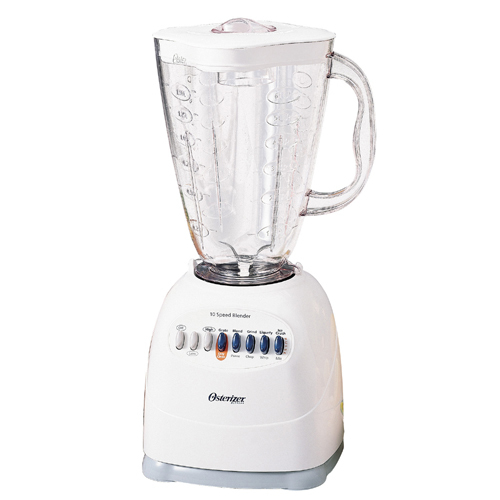 - Classic Osterizer Cube Style blender designed with highly durable components. - Revolutionary Ice Crusher Blade is designed to toss, catch and shatter ice as it falls. The result: perfectly crushed ise every time. - The Osterizer NEW cube style blender by Oster, has an extremely powerful motor for professional results whether blending your favorite milkshake, chopping tomatoes for salsa, or crushing ice or frozen fruit for a daiquiri or smoothies. Select from 2 speeds using the dial control. The 5 large cup glass carafe is dishwasher safe, worry free cleaning. Here AAWSALES.com, every one of our items are discounted and always on sale. And to show our appreciation, we also have Wholesale Pricing, and VALUABLE FREE THANK YOU GIFT PACKAGE offers for our customers!